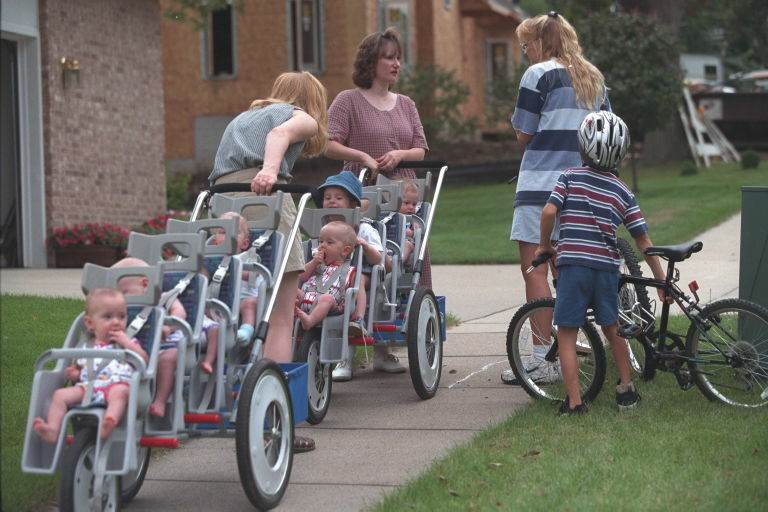 On November 19, 1997, Bobbi McCaughey and her husband, Kenny, made headlines when she safely delivered the world’s first surviving set of septuplets in Des Moines, Iowa. The arrival of Kenny Jr., Alexis, Natalie, Kelsey, Nathan, Brandon, and Joel — born at 2.5 pounds to 3.4 pounds — was heralded as a medical miracle. 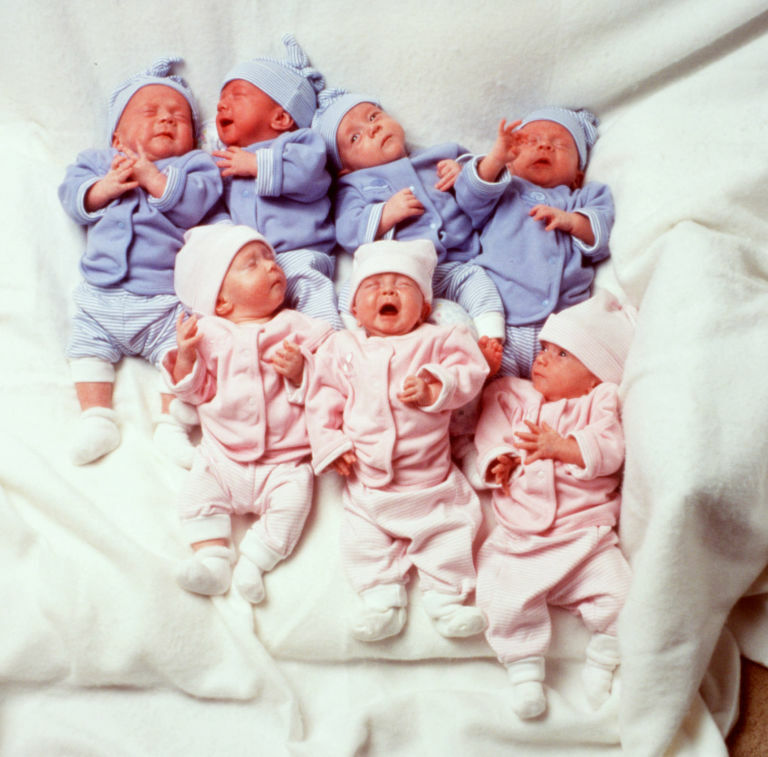 The McCaughey septuplets at 3-months-old on March 2, 1998. Bobbi and Kenny had pursued in vitro fertilization after the birth of their daughter Mikayla. But when they learned that she was carrying seven embryos, the religious couple chose to keep them all — which thrust them into a controversial spotlight. But after the babies’ safe delivery, it’s been a relatively normal road to adulthood, except for the media requests the family fields each year around the kids’ birthday. Or the fact that they live in a seven-bedroom house that was donated when the kids were born. Or the free vacations and food and college tuition they’ve been given. Or the time they met President George W. Bush. Bobbi is employed as a para-educator for special-needs children — in addition to the work of raising eight children. Both she and Kenny have tried to instill that work ethic into their kids. The children have all held jobs (they have to buy their own cell phones!) and saved money for college. But they won’t necessarily need it: at birth, several universities offered them free college education. At least three of the kids — Natalie, Nathan, and Joel — plan to attend Hannibal-LaGrange University in Missouri, one of the schools to offer tuition. Natalie intends to study elementary education, while Joel and Nathan will both pursue computer science. Nathan and Alexis were born with cerebral palsy and each underwent childhood surgeries to help them walk. Nathan battled day after day to finally learn to walk on his own. Alexis still uses a walker, but this year, she was the school cheerleading squad’s co-captain. Alexis intends to pursue preschool education at Des Moines Area Community College, where Kenny Jr. will be pursuing construction studies. Kelsey is in all state choir and wants to pursue a career in music, though she’s not sure which school she will attend. For Bobbi and Kenny, facing an empty nest feels surreal after years packed with the activities and the joy of eight children at home. “Everything is the last,” Bobbi told theDes Moines Register. “The last marching band performance. The last cross country meet. The last choir concert. It’s sad to see things end, but there will be a lot of firsts coming. You have to get to the lasts to get to the firsts. 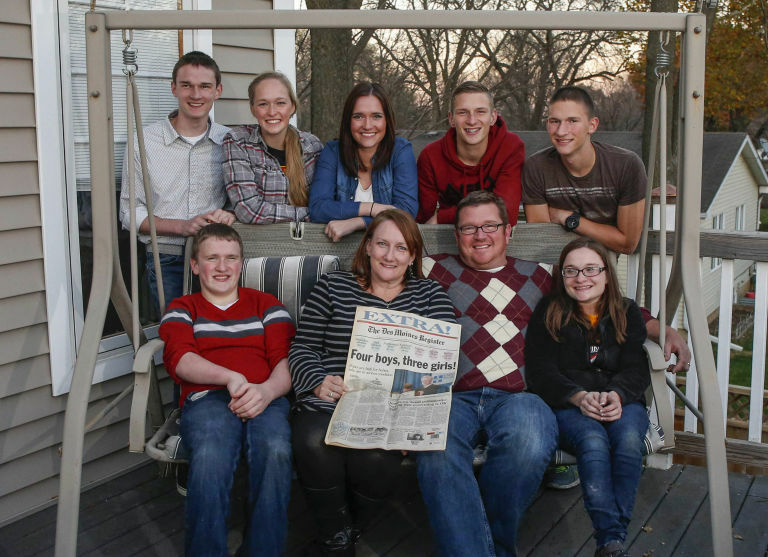 Bobbi and Kenny McCaughey with (clockwise from the back left) Joel, Natalie, Kelsey, Kenny Jr., Brandon, Alexis, and Nathan at home in Iowa.